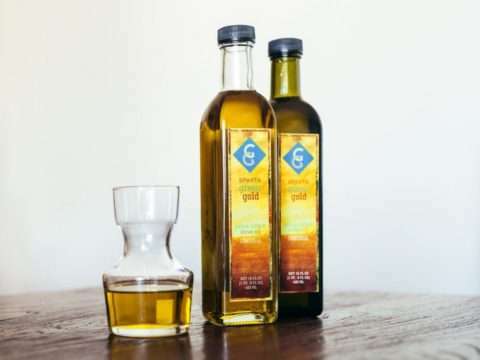 The GREEN GOLD LAKONIA, Extra Virgin Olive Oil Lakonia, is a premium quality olive oil extracted by fresh olives using solely a mechanical process without the use of chemicals or excessive heat. 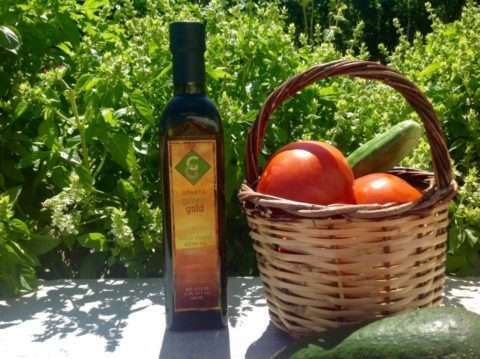 Therefore, the GREEN GOLD LAKONIA, Extra Virgin Olive Oil Lakonia keeps all its rich flavor, golden color, fruity aroma and high nutritional value of Koroneiki olive variety. It is certified by AGROCERT. Available in dark green or transparent glass bottle of 500ml. * Extra Virgin Olive Oil: olive oil where the content of free fatty acids (acidity) does not exceed 0,8gr per 100gr (0, 8%). Fresh olives contain very few carbohydrates and are a very good source of monounsaturated fatty acids (oleic acids). Thanks to their high content in tocopherols they are a good source of vitamin E, while they contain high amounts of minerals such as calcium, iron, phosphorus, potassium, zinc, selenium, etc. The oil produced from fresh olives contains phenols and other nutrients such as protein, vitamin C, vitamin K, histidine, isoleucine, methionine, phenylalanine, etc. Olive oil improves liver functions by cleansing the body because of the natural chlorine it contains. Vitamins A, D, E, K help bone development in children and adults. According to scientific studies, polyphenols protect against cancer and have anti-inflammatory properties. Vitamin E and other antioxidants found in fresh olives reduce the risk of cell damage and inflammation. The oleic acid, a key ingredient of monounsaturated fat in olive oil, affects the growth of oncogene (HER-2 neu) which is responsible for the development of breast cancer. Monounsaturated fats, besides being antioxidants, have a positive impact on cholesterol levels: olive oil helps reduce LDL (bad) cholesterol levels and raises HDL (good) cholesterol levels. Olive oil consumption is recommended for diabetics, as monounsaturated fats help blood glucose levels to drop. The oleanolic and maslinic acids control cell proliferation and intestinal tumor development. Olive oil helps women in menopause by reducing hot flashes. It is also beneficial for skin and hair, helping restore damaged follicles, offering hydration and radiance. Used in many skin care cosmetic products, it improves skin elasticity, moisturizes the skin and prevents wrinkles. 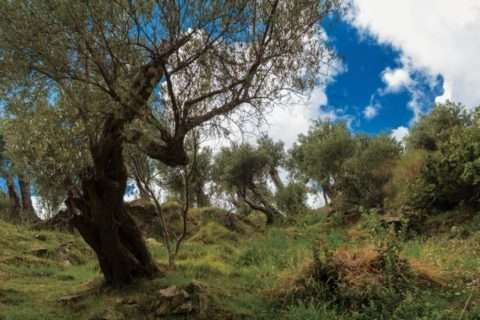 The traditional Mediterranean diet, following the eating habits of the inhabitants of Crete and southern Italy in the early 1960s, has been recognized after long-term scientific research as the healthiest diet. A low-calorie diet yet rich in flavor and aroma, is known for its beneficial properties: it provides energy, protects against heart attack and various forms of cancer, helps the good bowel function, etc. This diet is increasingly gaining ground in recent years, as numerous studies have shown that the Mediterranean region population live longer and suffer much less, compared to Americans and northern Europeans, from bowel and breast cancer or heart diseases. The menu is simple and based on a frugal diet: raw olive oil, fresh vegetable and fruit, legumes and pulses, unprocessed cheese, homemade whole wheat bread, nuts, fresh fish and a glass of homemade wine. These basic features of the Mediterranean diet (high intake of fruit, vegetables and unsaturated fat) undoubtedly protect the skin from the signs of aging, i.e. wrinkles. Combined with daily physical exercise, the Mediterranean diet menu is a key for longevity, health and beauty. In 2010, the Mediterranean diet was added to the list of Intangible Cultural Heritage of Humanity by UNESCO.